CHICAGO -- Torrential downpours across a broad swath of the U.S. Midwest this week are easing the worst drought in more than 50 years, flooding streams, snarling river transportation, stalling corn plantings -- and changing the outlook for the American farm economy in 2013. The Army Corps of Engineers is closing locks along a 150-mile stretch of the Mississippi River from roughly Davenport in Iowa to Hannibal, Mo. Barge traffic was backing up Thursday, as water levels were too high for barges to take on grain. The Mississippi and other major rivers are expected to begin cresting Sunday -- and likely will run over levies in some areas. That is a sharp reversal from as recently as January, when low water levels disrupted the main water thoroughfares that bring grain from the nation's breadbasket to the world's markets. "These rains are really helping bring most areas out of drought status. And the rain encompasses all of the western Corn Belt that was previously dry," said Don Keeney, meteorologist for MDA Weather Services, a widely followed commercial forecasting firm. If the drought is ending, it would represent a sea change for the farm economy, where expectations for another dry summer had been baked in. Continued rainy weather could further delay spring plantings, cause a sharp fall in the price of farm commodities, and lower the cost of everything from hog feed to cereal ingredients. Lower feed prices would help livestock and dairy producers, but soft grain prices could cut into farmers' incomes and perhaps even cause farmland values to retreat from recent record highs. An end to drought conditions would bring a burst in economic activity across the agriculture industry -- from farmers in the fields to those operating grain elevators, processing companies and shippers. "If in fact the drought is easing, and if we are migrating to a situation that might afford better yields, to my mind, for the full value chain, it's a godsend," said Bruce Scherr, chief executive of agribusiness analytics firm Informa Economics. "Another year like last year would be devastating." The 2012 drought brought corn production to only 10.8 billion bushels, a 6-year low, with yields reaching a 17-year low of 123.4 bushels an acre. The production losses added to the impact of rising exports to China and domestic demand for ethanol production to drive corn prices on the Chicago Board of Trade to an all-time high last August. Farmers filed a record $11.8 billion in crop-insurance claims, according to Agriculture Department data. And farm income fell last year by 3 percent from a record set in 2011. 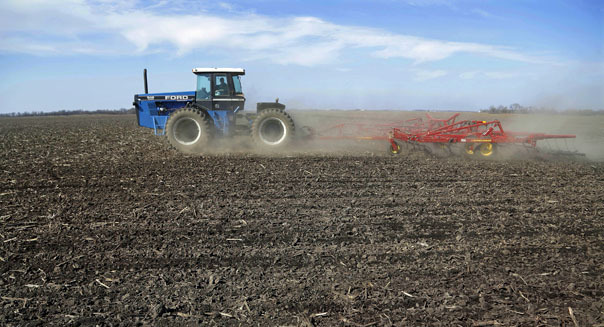 "Isn't it ironic that all winter we've been worried about dry soil, and all of that has changed in a period of four or five weeks," said Rich Feltes, vice president of research for Chicago commodities brokerage R.J. O'Brien. Drought conditions persist in the southwest corner of the U.S. Plains where hard red winter wheat is a dominant crop. Southeast Colorado, southwest Kansas and the Panhandles of Texas and Oklahoma remain dry, Keeney said. The western states of Kansas and Nebraska would need another 2 to 4 inches of rain to end the drought, he added. In the western Great Plains, where some areas have experienced three years of dry conditions that have eliminated subsoil moisture, even a flurry of steady showers may not cause the drought to break. "We just have very serious drought issues and we will not be able to eliminate them overall," said Dennis Todey, state climatologist with South Dakota State University, during a National Weather Service drought update call on Thursday. For the rest of the Midwest, though, the drought may be ending. Even before this week's rains, early spring showers had ended the drought in roughly the eastern two-thirds of the Midwest, Keeney said. Since Saturday, more than 6 inches of rain has fallen in some areas, with much of the upper Midwest receiving at least 2 inches. Weather forecasters were predicting as many as 4 inches of rain in the next 24 hours. Heavy rains overnight Thursday caused flooding in some areas, closing roads and clogging river traffic. In downtown Chicago, at least one expressway closed Thursday morning due to standing water, and commuter rail lines were delayed by switching problems related to the heavy rainfall. High water also hindered barge loading at riverside grain terminals, while swirling currents impacted movement. At Gulf of Mexico export terminals, prices for corn and soybeans jumped by 10 cents a bushel as shippers scrambled to fill ocean-going vessels before much Mississippi River traffic grinds to a halt. "When the river gets to these levels, people might not have enough clearance to get a barge under the barge spout to start loading it," said Gerald Jenkins, general manager at Ursa Coop, which owns three river elevators. "If it's not an issue today, it will be within a day or two because the river is expected to go up at least another 5 or 6 feet." Rising water on the Mississippi River was forecast to close seven river locks from Muscatine, Iowa, to Saverton, Mo., beginning on Friday, effectively halting barge shipping until at least next week, after the river crests starting on Sunday. As recently as February, low water levels on the Mississippi had forced the Army Corps of Engineers to dredge shipping channels between St. Louis and Memphis, Tenn.
More flooding could come in the next day or so in Missouri, northern Illinois, southeast Iowa and west central Indiana, forecasters said. The Red River Basin, between North Dakota and Minnesota, also was expected to overrun its banks in late April, which would bring floodwaters into the grain fields of Manitoba, Canada. The wet weather has caused U.S. corn plantings to fall behind the typical pace for spring seeding, but agronomists said farmers still have plenty of time to plant corn. And those who cannot get corn in the ground by mid-June can turn to soybeans, another cash crop. "It's certainly delayed, especially when compared to last year's early start, but it's not late yet," said Robert Nielson, agronomist for Purdue University, West Lafayette, Ind. The U.S. Department of Agriculture on Monday said 2 percent of the U.S. corn crop had been planted. Last year, 16 percent of the crop had been planted, and over the last five years, an average of 7 percent of the corn crop had been planted by this date. Nielson said Indiana farmers would plant corn through the month of May, even on into early June, before switching from corn plantings to soybeans. Farmers who wait that long would switch to hybrids that mature more quickly than common corn, he added. Emerson Nafziger, agronomist for the University of Illinois, said any further delay in planting could affect crop yields. "Nobody is panicking yet, but it does put planting behind, and everyone knows that on average late planted corn doesn't yield as well," he said. Gary Blumenthal, head of agricultural consultancy World Perspectives in Washington, said farmers who spent most of last summer desperate for rain are now concerned they won't get to plant their corn on time. "There's a lot of uncertainty, but it's just uncertainty," he said. "I'm not sure we are at the point where we have certain adverse impact. My goodness, it's only April 18."